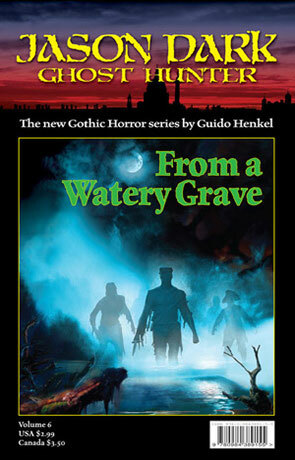 From a Watery Grave is the 6th novel in the Jason Dark series of dime novels by Guido Henkel. A quaint seaside town seems the ideal place for an English summer holiday. Little do its inhabitants suspect, that a century-old curse is about to throw their idyllic existence into turmoil and terror. Wraith-like, the black ghosts of undead mariners spread their cloak of horror over Pegwell Bay, the lure of their cursed gold too much for most to resist. Can Jason Dark and Siu Lin find the key to unlock their secrets and lift the curse from beyond the grave before more innocent townspeople die, or will some villainous trickery put even their own lives in jeopardy? This is actually the first Jason Dark novel I have read, which hasn't prevented me enjoying this "dime novel" (essentially a novella) at all. The Jason Dark series is set in Victorian times and features characters both real and fictitious including HG Wells who is a friend of Jason Dark's and set before he started writing. This must put the date of the stories sometime before 1895 (the year his first novel "the Time Machine was published). Doctor Watson also makes an appearance or three and we even get a glimpse of the eminent Sherlock Holmes. While the subject matter is clearly horror related, this isn't so much a horror novel as a Victorian detective one, as Jason Dark and his sidekick (who literally has a blinding side kick) investigate the haunting of the small seaport town of Pegwell Bay. The Town is a real life location near Ramsgate and is famous for being the area where three out of five of the most important invasions of Britain took place (Roman invasion, Hengist and finally Horsa). It's also one of the BBC's Seven man made Wonders and is now famous for it's wildlife. The story is written in an easy reading, uncluttered style that is quite reminiscient of Sir Arthur Conan Doyle and the Sherlock Holmes series. The characters are lively and the plot fast enough to keep the interest while the beginning of the book is just great, telling the tale of the ship De Rooswijk becoming wrecked back in 1739. To further give weight to the story, this was also a real ship owned by the Dutch East India Company that became wrecked on Goodwin Sands 8km from the English coast. In 2005 Artifacts were recovered from the shipwreck included approximately one thousand bars of silver, gold coins and a mustard jar. Clearly the author has done his research for the story, and it does show. Being a fan of Sherlock Holmes, I must admit I felt quite at home reading From a Watery Grave, it is a well written and rewarding Dime novel that should appeal to all ages. Written on 19th December 2010 by Ant.